Over the weekend, this chart was widely discussed in the blogosphere. For many Americans, the amount they pay in taxes is larger than any purchase they make during the year, but studies show they know almost nothing about where that money goes to. This contributes to ridiculous beliefs, like the view that 20% of government spending goes to foreign aid, for example. An electorate unschooled in basic budget facts is a major obstacle to controlling the nation’s deficit, not to mention addressing a host of economic and social problems. We suggest that everyone who files a tax return receive a “taxpayer receipt.” This receipt would tell them to the penny what their taxes paid for based on the amount they paid in federal income taxes and FICA. My main problem with this chart is that is that it doesn't include all tax revenues and expenditures. When you look at all expenditures, including state and local government, a bigger slice goes to education. I suppose I'm just being nit-picky. Overall, I love the idea about making the public more informed about where their tax money goes. Next > Is There an Ivy League Advantage? I know everyone isn’t a statistician, but please, this should be a dot plot…maybe a horizontal barplot. The Third Way needs to hire someone who knows how to visualize data….is that so hard to ask. Is there some discussion somewhere of the original analysis? Why did they pick $34,000? That is well below median household income. A higher income family would show a little less going to Social Security and Medicare, I think. The foreign aid piece will be pretty small no matter how you slice it, though. However, I recall that Joe Biden specifically mentioned foreign aid, in the vice presidential debate, as an area that the Obama administration would use to achieve its promised “net spending reduction”: you can’t expect people to be better informed than their rulers. To be fair, Biden may have been more specific than Palin. Not more honest, though. A higher income family would show a little less going to Social Security and Medicare, I think. That percentage going to SS stays steady until well into the six figures. But, this hypothetical guy must have no deductions. To me, the biggest omission on this is the lack of an ‘other’ category because there is only about $3,000 listed there. It seems a bit strange not to note that somehow. Well, it does say in its heading that it is only “selected items”. I don’t think it makes any pretense of representing your tax contribution to the entire federal budget. They say in their material that they chose many categories of common interest–several of them are talking points for various politicians–and are showing the relative input from your taxes into each of these selected categories. I don’t know what the “Third Way” is, but I agree with y81 that I think the table was done to highlight how much SS costs the low middle class. There’s a discussion of this table at Megan McArdle’s blog. 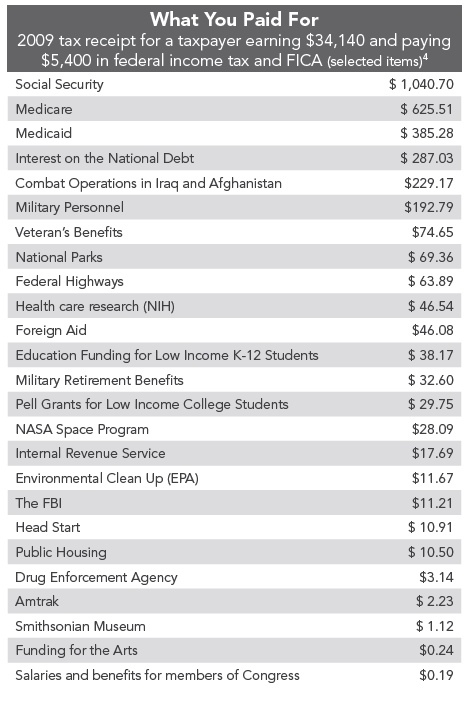 The commentors there pointed out that this table doesn’t include the borrowed money that gets spent. It seems to do something along the lines of seeing what percent of the budget each of those items are, and then allocating them to the $5K that a 34K person may pay in fed taxes. It’s a hokey calculation that’s only useful to illustrate some point (though it’s not clear to me what that point is — you could use it to argue that SS is a really big expense, or use it to argue that most of your money comes back to you, or that very little of your payment goes to foreign aid). I don’t think deductions actually makes much of a difference, because at that income level, most of the taxes are FICA. That was my confusion. Most of this guy’s taxes aren’t FICA as FICA is under 8% and this guy is paying over 15% total.